This emergency plan offers 24 hours of free care for over 18s should carers be called away in a emergency and named friends and family can’t cover for you. It’s a free service, funded by Cambridgeshire County Council, run through Carers Trust Cambridgeshire. And replaces the old ICER scheme. To make sure you’re covered, register for What If (even if you used to be in ICER). Peterborough carers providing regular and substantial care can register for a separate emergency scheme run by Peterborough City Council. 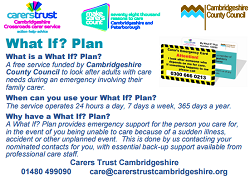 Call 01733 747474 and ask for the Emergency Support for Carers service or visit the Peterborough City Council website for more information and to register. Feeling overwhelmed with your caring duties and responsibilities? This scheme, accessed via your GP surgery, could be a lifeline for you. If you are struggling to cope, you can get a one-off Family Carers Prescription for a short term, one-off break. The scheme is available to carers registered with a GP surgery within the Cambridgeshire and Peterborough Clinical Commissioning Group. And gives you access to a support worker at Carers Trust Cambridgeshire and together you can design a break that works for you. This service incorporates out of hours/NHS 111 schemes. Note: Wisbech patients are part of the Norfolk NHS 111 and Out of Hours service. NHS 111 services have been extended to offer a more services and specialist clinicians such as GPs, pharmacists and health advisors 24 hours a day, 7 days a week, 365 days a year. For patients who are in need mental health support, dial 111 and select option two. You can speak directly to a member of the mental health crisis team. 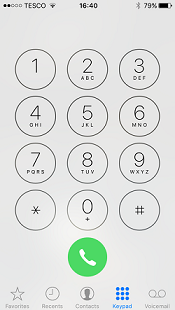 All calls from both mobiles and landlines to 111 are free. Crisis point in the family? 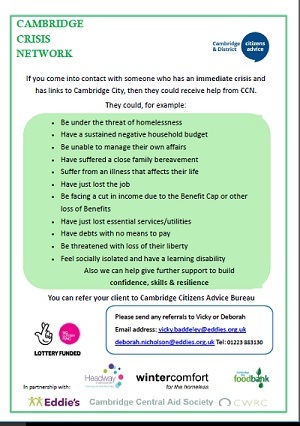 CCN may be able to help with things like stress, bereavement, debts, homelessness, job loss or benefit changes.